The White-crowned Pionus or White-crowned Parrot (pionus senilis) is endemic to western Panama to south-eastern Mexico in San Luis Potosi and southern Tamaulipas, mainly along Pacific slopes. Its preferred habitat includes the lowland areas and foothills locally up to 1600 m altitude, usually they are hidden in the forest canopies or can be found along the edges and adjacent semi-open woodland and second growth. The White-crowned Parrot feeds in social flocks of 30-50 birds, which may wander outside the breeding range once nesting has finished. It feeds on taking various seeds, nuts and fruits, and can be pest in crops of corn or sorghum, and commercial fruit plantations. It can be unobtrusive when feeding since it is slow-moving, usually silent, and keeps in the canopy. However, at rest it often perches conspicuously at the top of an unopened palm frond. Its flight call is a screeched kreeah. 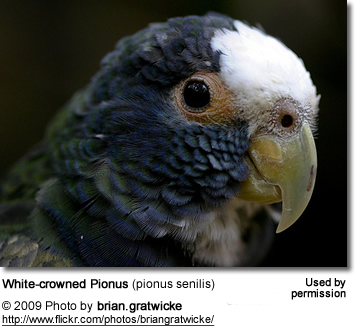 White-crowned Pionus are listed on Appendix II of the Convention on International Trade in Endangered Species (CITES). Wild populations are generally large and locally common but are vulnerable to habitat destruction and have declined in some areas due to capture for export and use for pets locally in other areas. In the past very large numbers were traded and used locally for pets. White-crowned Pionus were imported in large numbers into the United States but are not commonly bred. Therefore, captive-bred birds are hard to find. The White-crowned Pionus is a medium parrot averaging 9 to 10 inches (24 cm) in length and 230 - 260 g in weight. Males are generally larger and have deeper and more extensive blue than females and have larger heads and beaks. The adult male has a white forehead and crown, the feature which, likened to an old man's white hair, gave rise to the specific name senilis. The throat is white, and the rest of the head, neck and breast are dull dark blue. 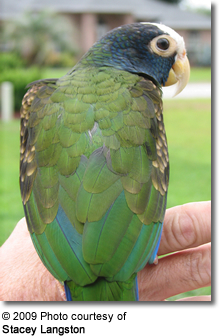 The belly is light green, and the upperparts are dark green, with a yellow-olive shoulder patch. In flight, the blue underwings and red vent are conspicuous features. 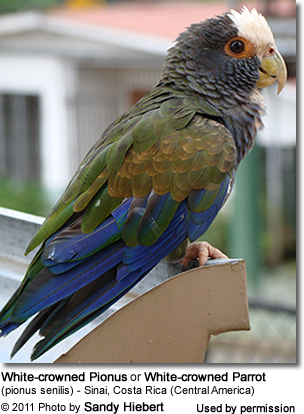 The female White-crowned Parrot is similar to the male, but the blue plumage fades into scaling on the lower breast and the shoulder patch is duller. Males tend to be larger and more colorful than females. Surgical sexing or DNA sexing is recommended to identify the correct gender. Young birds have little to no blue on the head and neck or red on the undertail, and the crown feathers are green edged with white. The eyes or both juveniles and adults are dark brown. 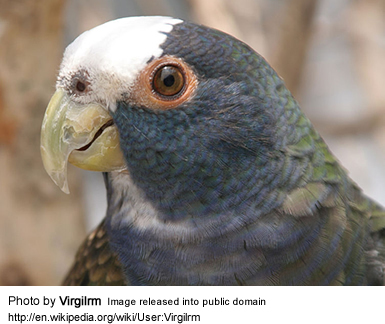 White-crowned Pionus are popular in the pet trade as they generally make great pets. Young birds tend to be docile and are easily tamed and they don't mind being handled provided they are properly socialized. They are not known for their talking abilities; although they are intelligent and rather inquisitive. They tend to be on the shy side. These naturally active birds may become overweight if not sufficient opportunities for exercise are provided. Mature white-crowns, particular males, may bond to only one person and are known to aggressively protect that person from others, including other family members. Male White-crowns can be aggressive toward their mates, as can sexually mature parrots to their owners. This is natural behavior but needs some training and understanding by the owner to prevent it from turning into permanent aggressive behavior. Clipping the wings of the male prior to the breeding season may be necessary in aggressive individuals to allow the female to escape in case the male becomes aggressive. Males in breeding condition can be very aggressive to keepers. When white-crowns are in breeding condition their eye-rings and feet become bright orange. They are moderately noisy when in breeding season. 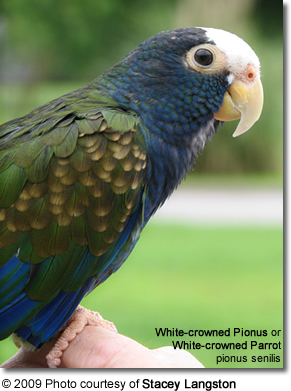 When breeding Pionus parrots, noise and proximity to neighbors must be considered. In the wild, hens usually lay 3-6 white eggs in unlined nests - usually a natural cavity in a tree or a hollow palm stub. The incubation period approximates 24-26 days. Chicks will usually fledge when they are about 8 to 10 weeks old. In North America, White-crowned Pionus breed predominantly in the spring and have a limited breeding season typically from February or March to June or July. 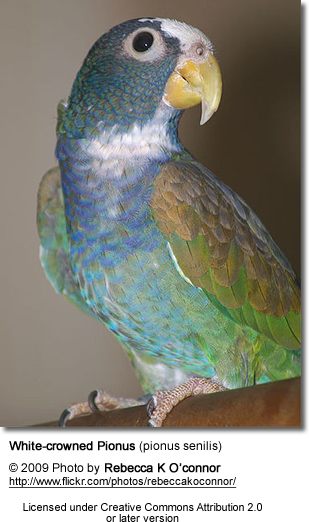 In captivity, the White-crowned Pionus parrots are difficult to breed; and it is hard to handrear chicks from hatching. Chicks will do much better if allowed to be parent-fed for 1-2 weeks. The rearing diet should be rich in protein and fat, such as Pretty Bird 19/15 or 19/12. The hen typically lays 3 to 5 eggs, which she incubates for 24 to 26 days. The chicks usually fledge when they are 8 to 12 weeks old. Various green foods and mealworms are appreciated by the parents for feeding the chicks. Corn cob is a favorite weaning food. A suggested size is 4 feet wide by 4 feet tall by 6 to 8 feet long, for sanitation, suspended cages - 4 feet above the ground or floor - work great. It is recommended to use one inch by one inch by 14 gauge welded wire, or 1" X ½ " welded wire for cage construction. Suspended cages facilitate sanitation as droppings and discarded food fall through the wire cage floor. A Grandfather style wooden box of the following dimensions: 10" x 10" x 18-24" is preferred. Place the nest box high up in a dark, secluded area of the aviary.